These reviews are posted after the kitset in question has been built. The review is an report on the experiences of the builder. 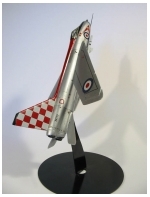 23 Oct 2009 Airfix 1/72 BAC Lightning F3. Posted by Sav. The Aircraft The Lightning was a product of the cold war and was the only British jet which was capable of mach 2 flight. Built primarily as an interceptor, its main features were its speed and climb rate, the Lightning had an initial climb rate of 50,000 feet per minute which is better than many contemporary jets today. Not bad at all for a 1950's bird. 19 Jun 2009 JAYS Model Kits 1/72 Supermarine Seafire Mk 47. Posted by Sav.